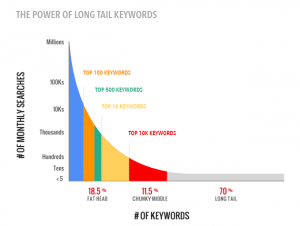 70% of online searches are made up of long tail keywords. Make sure you’re using them correctly with our top tips to maximise your profits. 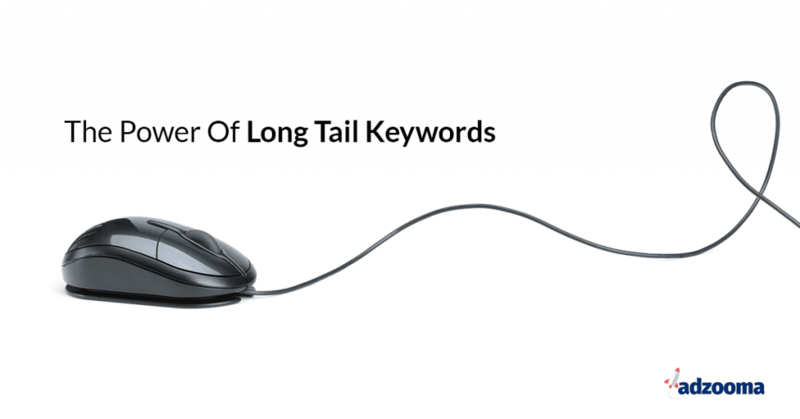 According to research, 70% of online searches are made up of long tail keywords. And although you may not realise, they actually help to drive more focused, motivated customers to your website. Plus, they are often easier to rank for, and cost less to advertise on, than comparable generic phrases. But how do you find out what these keywords are? And how do they affect your business? Long tail keywords are longer, more specific phrases people use when they know exactly what they’re looking for. They’re usually made up of three or four words and are used to target niche demographics. The length of these keywords makes them much more specific than short tail keywords such as “shoes” or “exercise,” that would’ve been searched for hundreds and thousands of times. In statistics, the “long tail” is the end portion of a distribution graph that goes on and on, showing that long tail keywords account for over half of all web searches. Long tail keywords often communicate the consumers intent to make a purchase, rather than their general interest. This makes them much more profitable than consumers who land on your website from making a generic search, and means they’re likely to stay on your website for longer. Not only does this increase your conversions, but it also results in lower bounce rates for your business and improves your quality score. 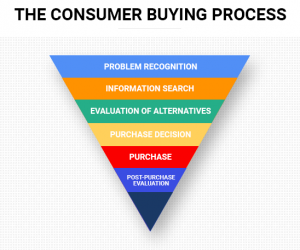 This relates to the customer buying process model, as customers tend to use long tail keywords when they’re close to the point of purchasing. You can find one of these on google images, they’re all quite similar and have 5 different steps. The consumer decides that they want or need to buy a product or service. The consumer begins their research looking for the product or service. At this point, they’re unsure exactly what they’re looking for so they do a broad search. The consumer compares the products or services they’ve found, deciding which they prefer the most. This is where they’re more likely to use more specific, long tail keywords because they know what they’re looking for. This is the penultimate stage where the purchase takes place. The consumer decides whether or not they’re satisfied or dissatisfied with the product or service and whether they want to give any feedback. As a consumer, if you’re looking to buy a new pair of high heels but you’re unsure which ones you want, you wouldn’t search for anything specific. You’d just search for “high heels” so you could browse and see which ones you like. After doing some research, it’s likely you’d have quite a strong idea of the sort of high heels you’re wanting to buy. Let’s say you’ve found a lovely pair of grey suede high heels. At this stage, you probably wouldn’t be interested in high heels that aren’t grey suede, so you’d narrow down your search by making it more specific. By searching for “grey suede high heels” rather than “high heels,” there wouldn’t be as many results because fewer businesses would be using this phrase on their site. This means you’d be able to find the heels you want much quicker, and go ahead and make your purchase. This is the same for businesses. Imagine you’re a company that sells shoes, it’s unlikely you’d rank highly on the results page for “high heels” due to the amount of competition. Loads of big businesses such as Missguided and Prettylittlething also rank at the very top of the results page, so consumers are likely to look there first. So even if the consumer did decide to buy some of the heels they saw the first time around, it’s unlikely they’d be buying them from your website. But, if you used the phrase “grey suede high heels” in your ad campaigns, you’d have a better chance of making a sale. This shows that you need to be specific if you want your customers to find you. Your ultimate goal is to rank highly on Google, so you must choose keywords that will help you to do so. Targeting long tail keywords in your Google Ads campaigns means the price you pay for each click you get (CPC) could be much lower. It all depends how many other people are bidding on your keywords, but long tail keywords are more ‘niche’ so there’s usually less competition for them. For example, if you use the keyword “high heels” you can usually expect to pay more per click than the long tail keyword “grey suede high heels”. However, even though ‘high heels’ will have more search volume, it’s far less targeted than “grey suede high heels”, making it less likely to convert into sales. Choosing long tail keywords is simply a matter of understanding what your customers are actively looking for, with their money in hand, ready to buy. To do this, you must first have a clear vision of your product, your business and your website. You need to understand what sets you apart from your competition and why people should buy your product or service. You want to determine the keywords your audience might be searching for and then include those phrases in your campaigns. This will help you to attract people who are searching for the exact products you sell, rather than people who are simply browsing online. A good starting point is to write down your USP (unique selling point) and the key benefits of your business. Then go to your competitors’ sites. If you don’t know who your competitors are, you can find them by googling your product or service and seeing which websites come up. Once you’ve found them, try and distinguish what makes you different. What makes your products unique? If you sell high heels, what colour are they? And are they leather, open-toe or court heels? Be as specific as you can. Although long tail keywords have a low search volume, they allow you to attract an audience that’s much closer to the point of purchasing than your competitors’. So, while more specific searches may bring you less traffic, the customers you do attract are more likely to make a purchase. Think about it this way. 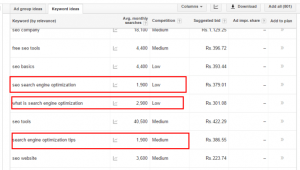 If your business runs 50 campaigns targeting long tail keywords that only get a couple of searches each month, you might still get over 100 searches every month from profitable customers. Or, you could run 10 campaigns targeting a mix of generic keywords and drive more traffic to your website, yet they could be consumers who aren’t necessarily going to buy. This means that by using long tail keywords, your return on investment (ROI) has the potential to be much higher than your competitors’. Long tail keywords are essential to your campaign success and may be the difference between driving 100 and 1000 customers to your business. They’re definitely worth the time and effort, but you must keep in mind that you won’t get a tonne of customers straight away as they have a low search volume. But, if you don’t think keyword research is for you, it might be worth looking for a quicker solution. This is where Adzooma can help to grow your business through a suite of easy to use tools. Our ‘done for you’ service provides you with everything you need to start attracting new customers online. All of the hard work is left to us, while you’re able to sit back and follow up on your leads.